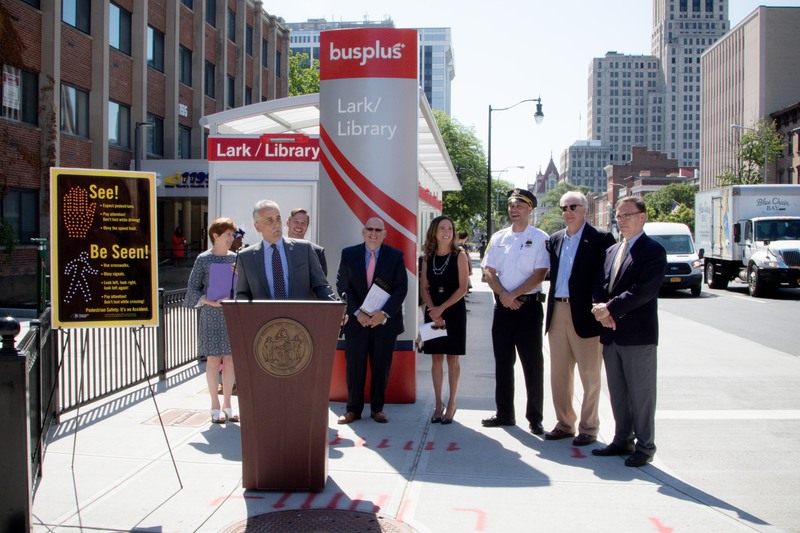 The Capital District Transportation Authority (CDTA) and several of its partners celebrated the completion of the Lark and Washington Transit Improvement Project at a news conference Thursday morning in Albany. This cooperative project focuses on a three-block area of Washington Avenue, where many improvements were made for customers waiting for buses and walking to buses. The project also focuses on improving traffic operations and safe pedestrian crossings and movement. The 2018 State Public Transportation Partnerships Conference is scheduled for August 15-17, 2018, at the Radisson Blu Minneapolis Downtown. The New York State Energy Research and Development Authority (NYSERDA) recently announced up to $5 million for proposals to improve operations and reduce greenhouse gas emissions for public transit systems throughout the state. Proposals must achieve energy savings through reducing traction power energy use; increasing the efficiency of transit buses; or developing new hardware and software technologies that improve transit agency operations and ridership. The funding will be awarded through a two-part competitive process. First, applicants must submit concept papers before August 7. Concept papers must be for technical feasibility studies, new product development or demonstration of technologies and business models. All projects should be economically viable, replicable and relevant to transit agencies in New York State. On June 25, the Federal Transit Administration (FTA) announced a Notice of Funding Opportunity (NOFO) for $366.3 million in Fiscal Year (FY) 2018 funds for buses, bus facilities and bus equipment. In the most recent round of Buses and Bus Facilities grants, which were announced in April, FTA awarded Buses and Bus Facilities grants using FY 2017 funds and $38 million of FY 2018 funds. The new NOFO allows applicants to request grants for the remainder of the competitive bus program. In total, Congress appropriated $408 million for the competitive Bus and Bus Facilities competitive grant program in FY 2018, which is $161 million (or 65 percent) more than the Fixing America's Surface Transportation Act authorized level. Applications are due by August 6, 2018. To view the NOFO in its entirety, including eligibility and submission instructions, please click here. Uber and Lyft came to prominence with their ride-hailing services. But increasingly they’re betting on other modes of transportation — with the aim of becoming the only service people need to get around cities. Lyft on Monday struck a deal to buy the core parts of Motivate, the parent company of CitiBike in New York and seven other bike-sharing programs around the United States. At first, that acquisition may seem puzzling — why would a ride-hailing giant want to get into the far smaller market for bicycles? — but there’s a bigger idea at work here. NYPTA is pleased to partner with the Capital District Transportation Committee to offer a full-day National Association of City Transportation Officials (NACTO) Design Guide Training on Tuesday, October 23, in conjunction with the NYPTA Fall Conference at the Albany Marriott. During the second half of the day, participants apply the lessons learned in the morning to a hands-on design charrette. Attendees are broken into groups and encouraged to directly apply the toolkit in the Guide to a specific corridor or street section. They may be assigned roles within their groups by mode (e.g., transit operations, typical cross-sections, pedestrian & bicycle interactions), and may be assigned specific locations within a larger study area. The training is just $69 and includes a copy of the NACTO Transit Street Design Guide, continental breakfast and lunch. Register at www.nytransitconference.org under Full Conference & Commuter Registration or RTAP Conference Registration.